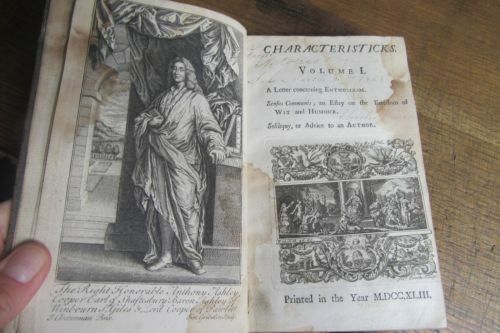 Back in November 2015 I wrote a post entitled “English Editions of Shaftesbury’s Characteristicks”. In it, I reviewed William E. Alderman’s 1967 paper of the same name, bringing his otherwise excellent list up to date, and adding a few other scraps of knowledge of my own on the subject. I am taking this opportunity to add something else that has just come to light. Among other things, I had claimed that Baskerville’s (1773) “was the first edition since 1737 to reproduce all of Gribelin’s engravings.” In making this claim, I also had the authority of Alderman (p. 326). I have just discovered (on October 31, 2017) that the claim is not entirely correct. 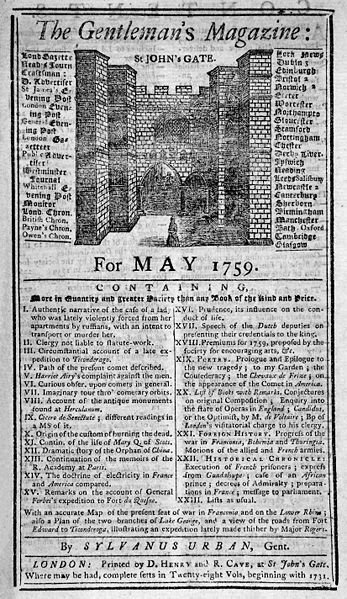 In fact, there was a 1743 edition that reproduced those original engravings (or very convincing reproductions – see below). Furthermore, even more interesting is that this edition is missing from Alderman’s list. I do not know who the printer was, but above is a photo of the Volume I title page as it appeared in the Ebay listing where I came across it. The listing is for Volume I only. Since it’s an odd volume, I cannot be sure that the other volumes bear the same date — or even that there are other volumes, since this one seems to be unique. Alderman did list a 1743-45 edition, but that was a duodecimo edition sans engravings. I have seen it, and it looks nothing like this. Tantalizingly, he also mentioned an apocryphal “Dublin 1743” edition once listed in a bookseller’s catalogue, which he did not include in his official list because he could not track down a specimen to examine (it had been sold). In any case, according to the seller’s description, this is an octavo London edition, and from what I can tell at this point, its appearance bears this out: besides containing Gribelin’s engravings, it preserves the pagination of all the previous “official” London editions. I have taken a gamble and ordered it. Once it arrives, I hope to be able to update this post with further information. In particular, I hope to confirm whether it is a London edition, and I hope to find out if there is any indication of a printer/publisher. Up until 1732 the work was printed by John Darby. 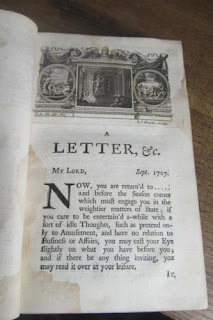 James Purser, who seems to have been successor to Darby’s business in Bartholomew Close, printed the 1737 edition. Was the 1743 edition also published by Purser? The latter was active into the 1740s, so it’s natural to assume so. However, confirming this may be difficult, since for each of the previous “official” editions of Characteristicks the publishing information appears only on the final page of the third volume, not in the first volume that is now on its way to me. He somehow owned or had the sanction to use the original Gribelin plates. He did his best to restore the text and pagination as it had appeared in the earlier official editions from 1711 to 1737. 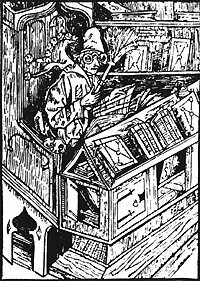 He had the nerve to print “The Fifth Edition” on the title page, indicating that he regarded his new edition as something more than an act of piracy or clever imitation. Of these facts, I believe the first is the most pertinent: the moral right to publication seems to have followed somehow the possession of the plates. Alderman points out that Baskerville’s claim to print the 5th edition was recognized as an error, for the errata sheet appearing in some copies — but not mine — corrects this to read “The Seventh Edition”, making it continuous with the 1737 Purser edition. This means that he regarded the 1733 edition and all others after 1737 to be unauthorized. What the “unofficial” 1733, 1743-45, 1749, 1757, and 1758 editions all lack are the Gribelin plates and the pagination corresponding to them. If it turns out that the main title page of this 1743 edition says “The Sixth Edition”, then I would like to explore further whether it is simply a reissue of sheets from the 1737 edition with a new title page. If, on the other hand, it says “The Seventh Edition”, then this would be evidence that Baskerville — like Alderman — was unaware of its existence. In any case, this 1743 edition, if it arrives as advertised and turns out to be an "official" edition, represents a small missing link in the rather large gap between 1737 and 1773, the period through which we must trace the hitherto mysterious route by which Baskerville acquired the Gribelin plates. It may be that the plates are just very convincing knock-offs and that this is a hitherto unknown pirate edition. Despite the graininess of the above photo, I can already spot one difference from the Gribelin plates. 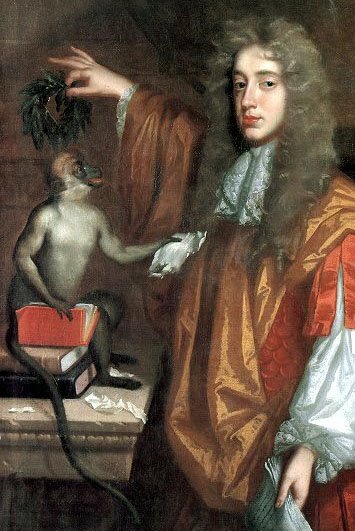 Also, the frontispiece portrait of Shaftesbury is not where one would expect to find it, which would be facing the main title page, not the volume title page. Once my order arrives, I will be able to examine more closely the name on the plates. At the moment, despite the low resolution of the photos, it looks like it could be that of John Brooks, an engraver active in Dublin until 1747, when he moved to London. If that is the case, it would confirm my real suspicion, which is that the city of publication is not London, and that this is a specimen of Alderman’s fabled “Dublin 1743” edition. ALDERMAN, William E. “English Editions of Shaftesbury’s Characteristics” Papers of the Bibliographical Society of America 16.4 (1967), 315-334. MEYER, H. E. “Correspondence: James Purser, Printer in Bartholomew Close, 1737,” The Library 27 (1972), p. 147.